Tickets will go on sale March 21st at the SGA Table, during Schools Lunches. On Wednesday March 22nd and 29th, tickets will be sold as well at the "Unique Apparel" kiosk during lunches. You may also purchase tickets on the Heritage High School PTSA website or at the door! Students - Do you want to be a judge for the Mr. Heritage Talent Night? 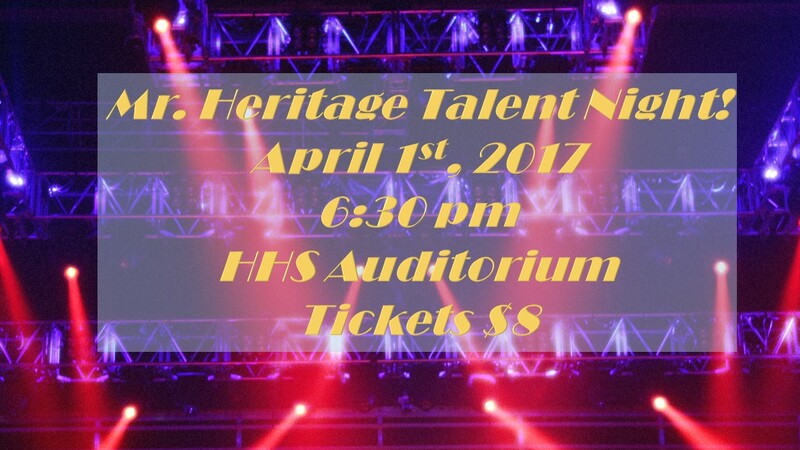 On behalf of the PTSA and SGA, two students will be selected to Judge this year's Mr. Heritage Talent Night Competition. The student judges will be part of a 5 Judge panel joining Special Guest Judges from our Wake Forest Business Community. Just submit your name at the SGA Table during Husky Help to be part of the Judge Raffle. Raffle begins March 27th and ends March 30th. Student Judges to be announced by the end of the day on March 30th. If you are chosen, you will be required to arrive by 5:30pm on April 1st for brief instructions prior to the show.